The Toronto subway system left the city on Sunday. After almost a decade of construction, a 6-stop extension of Line 1 breached the northern municipal boundary and traveled 1.5 miles into York Region, the area that adjoins Toronto’s northern border. It’s the first local subway expansion in 15 years and the second in a row to serve the suburban areas north of the central core. If you missed that Toronto was working on a major subway expansion, you certainly were not alone. The city’s other big transit expansion project, the deeply controversial and titanically expensive Scarborough subway extension, has been the principal focus of the transit conversation in Toronto for years. Since Toronto city council endorsed spending billions on the 1-stop Scarborough project, construction of the Toronto-York Spadina Subway Extension (also known as the TYSSE or the Spadina line extension) has proceeded in the background recently with relatively little fuss. Many of the new stations will be among the least used in the city. It didn’t start quietly, however. Building work began 18 months late in 2009 and the project soon became mired in problems. Design changes resulted in delays and legal disputes between contractors and the Toronto Transit Commission (TTC), some of which are still being resolved. A worker was killed and several others were injured when heavy equipment collapsed at a station site in 2011, and by 2015, the project was about $400 million over budget and two years behind schedule. TTC CEO (and now incoming New York City Transit Authority president) Andy Byford ordered a “complete reset” on the project that year, firing the TTC’s head of engineering, construction and expansion, the chief manager of the project, and hiring a brand new design team. Bechtel, the engineering firm, was also brought in to oversee the final years of construction. So why was the Spadina line extension built in a city that has a storied history of developing and cancelling public transit plans? Part of the reason is money. The cost was split four ways between the City of Toronto, York Region, the Province of Ontario, and the Government of Canada, with none paying more than $1 billion. The Scarborough project, on the other hand, is currently estimated to cost around $3.35 billion, the bulk being paid by the City of Toronto alone. The Spadina line extension that opened Sunday isn’t without its flaws. It came in over budget and it serves mostly low-density suburban areas. As a result, ridership is a serious concern. The line is expected to bring in about 1.2 million new passengers a year, which, as Toronto transit expert Steve Munro notes, is slightly less than the 1.5 million extra children expected to ride the subway thanks to the introduction of free fares for under-12s. Many of the new stations will be among the least used in the city. Artists selected through a jury process for each station worked closely with the architects on the blueprints. The Spadina line extension picks up at Downsview Park where Line 1 previously ended. Here, there is a new station with a surface connection to the provincially-operated GO Transit regional rail service. Trompe-l’œil artwork by Panya Clark Espinal decorates the interior. The line then snakes north to Finch West station, which was designed by *The Spadina Group Associates (TSGA), a joint venture between IBI Group, LEA Consulting Ltd. and WSP, in collaboration with British architect Will Alsop. With Toronto artist Bruce McLean, the architects created a colorful building supported by concrete sculptural forms that reference ancient Greek caryatids and Minorcan columns. Finch West station also includes a sealed-off second set of platforms for a future light rail line. At York University, Canada’s third-largest university, a sleek, boomerang-shaped subway station by Foster + Partners sits at the east end of the campus’ main quad. Inside, an array of reflective LCD displays by artist Jason Bruges react to changes in air pressure caused by the piston effect of arriving and departing trains. “It’s a dynamic, changing image as the train approaches, and comes into the station, and then departs,” said Golden. 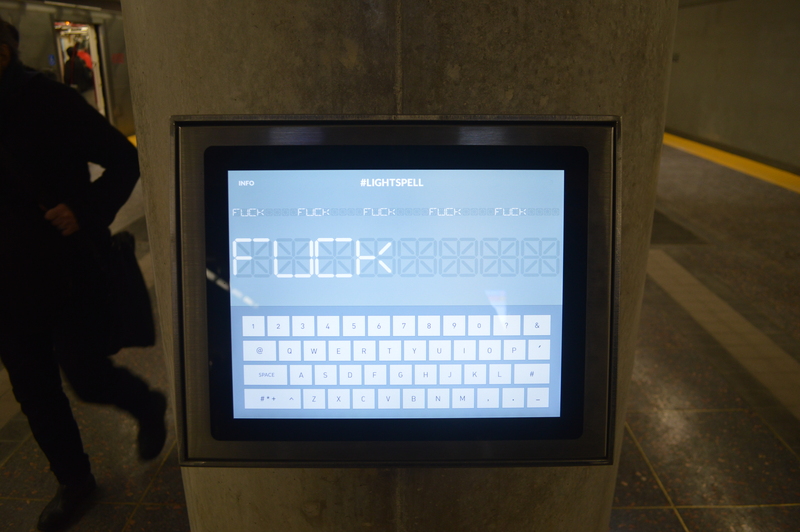 Inside Pioneer Village station (*also by TSGA with Alsop), named after a nearby open-air heritage museum, straphangers can type messages that will appear on giant 16-segment displays over the platform. Any letter of the alphabet plus the numbers one through nine can be entered, which Golden admits is a bold choice given the potential for abuse. The two stations outside the Toronto city limits make extensive use of natural light. Highway 407 station, which is also a major bus hub, is illuminated by walls of colored glass by artist David Pearl. The line ends at Vaughan Metropolitan Center, the nucleus of a new downtown being built at the south edge of the sprawling City of Vaughan. Before the subway arrived, this was the site of a suburban shopping plaza. The City of Vaughan wants the shell-like station designed by Grimshaw Architects to anchor a new urban community and give the city a sense of place and civic identity. The site immediately surrounding the station is being developed by SmartCentres, Canada’s largest builder of car-oriented, open-air malls anchored by Walmarts. In a break from company tradition, SmartCentres hired Diamond Schmitt Architects to create a cycling and pedestrian-friendly district. Central to SmartCentres Place are a 15-story office tower for KPMG, a mixed-use tower containing a YMCA, library, and other community facilities, and a park designed by popular Quebec landscape architect Claude Cormier. Diamond Schmitt and Cormier worked together to design a space capable of supporting a variety of uses, including concerts, markets, skating—maybe even the City of Vaughan’s Santa Claus parade. “We’ve tried to anticipate uses and hardwire it into the infrastructure of public space,” said Szabo. SmartCentres believe that by creating an inviting urban environment, the thousands of residential units that are currently under construction as part of the development will become an easier sell. Ultimately, Szabo hopes Vaughan Metropolitan Center will become one of dozens of dense, transit-oriented hubs in the Greater Toronto region, a plan supported by the long-range plans of the provincial government. *Correction: This story has been updated to properly attribute the architects behind Finch West and Pioneer Village stations.